As if that wasn’t enough, Richard Turner then headed over to Holland Bloorview Kids Rehab Hospital and presented a community outreach show, delighting children, staff and other members of the community with his charm, inspirational life story and unbeatable card manipulation techniques. CBC News stopped by to get in on the fun so check out (local) Channel 6 to catch CBC News early evening news tonight! He is, indeed, pure magic! Richard Turner is a card mechanic and is here in Toronto as part of the Luminato festival presenting FREE shows at the lobby of the TIFF (King and John). Yesterday, Eli Glasner, arts reporter from CBC News, stopped by to talk to Richard before his first show for Luminato. Follow us @sharingwonder to find out when that will be aired! 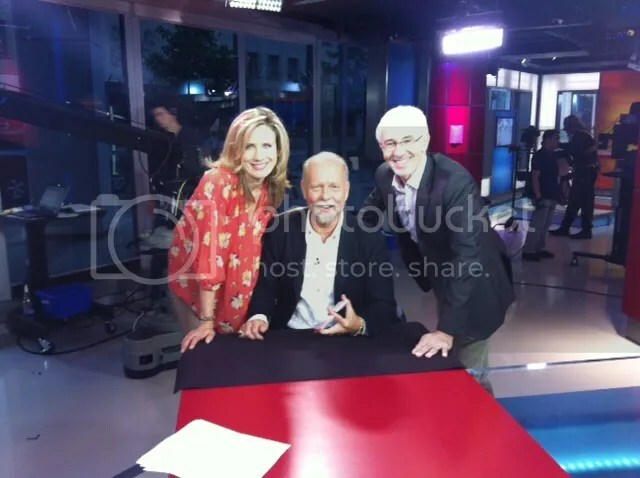 After a successful first show at the TIFF lobby yesterday, Richard was up bright and early to visit Global Toronto’s The Morning Show and demonstrated his amazing card manipulating abilities to Liza Fromer and Dave Gerry. What makes Richard unique is not only his extraordinary skill but also that he has overcome the challenges of being completely blind! Can’t be true? Well see for yourself! Don’t miss the world premiere of BANACHEK’S “The Alpha Project”! Discover the life of the world’s leading mentalist, Banachek, and hear the story of his exploration of telepathy, spirit channeling, ESP, prediction, metal bending, psychokinisis and past life regression. In The Alpha Project, Banachek reveals the beauty and danger of make believe.